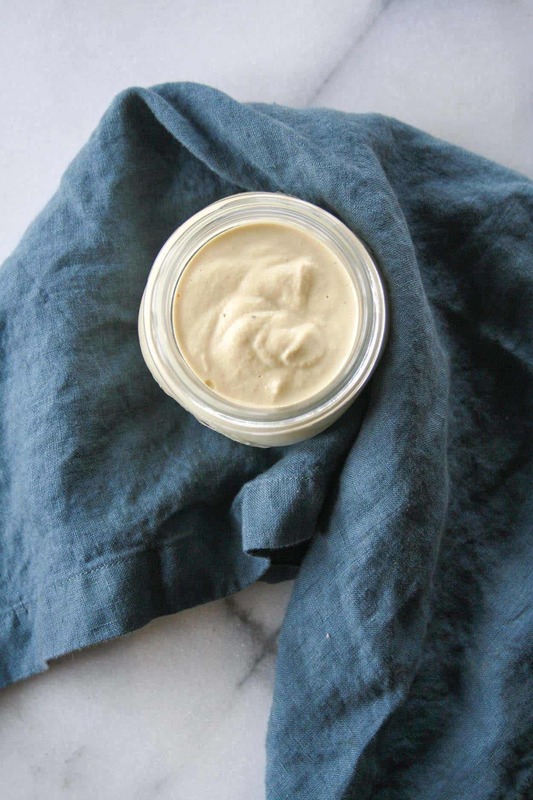 A vegan, cheese flavored cream sauce made from cashews and nutritional yeast. 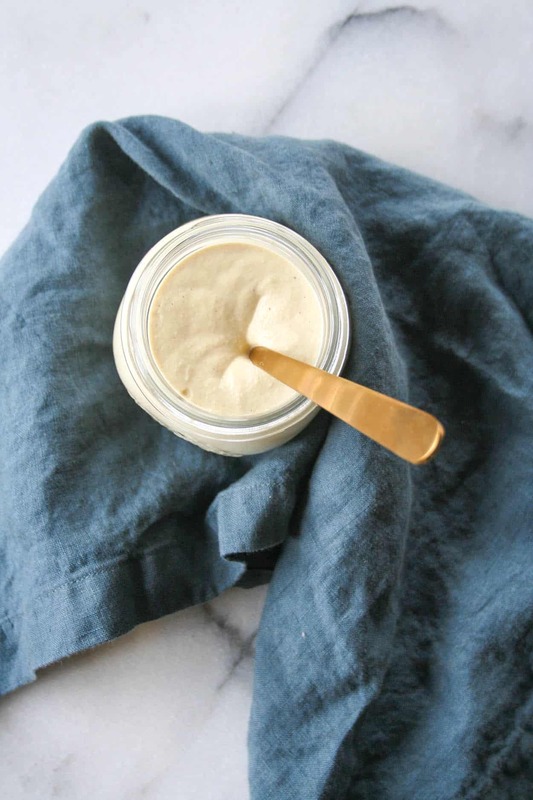 This simple, healthy, and delicious cashew cream sauce can be made in 5 minutes! For a while now, I’ve been seeing lots of people talk about the magic of nutritional yeast. Vegan and plant based food blogs praise it for its cheese-like flavor. And since dairy is strictly forbidden on the Whole30, I figured now was the best time to try it out. Vitamins B3, B6, B2, B1, Folic Acid, and B12. Obviously, the ingredient list did not explain in the least why I was experiencing this cheesy taste; but I didn’t care. Let’s make some Whole30 approved cheese sauce! Soaking your cashews is the key to this recipe and all other cashew-based sauces. This will soften the nuts and will help create a smooth even finish. I placed raw, unsalted cashews from Trader Joe’s in a bowl, covered them with water, and let it sit for 3 hours. After draining and rinsing the cashews, they went into my food processor with garlic, salt, water, and of course nutritional yeast. The result was an ultra creamy, cheesy, pourable, vegan, paleo, and Whole30 approved sauce! I poured this cashew cream sauce over sweet potato noodles, on top of some roasted chicken breasts, and love it over roasted vegetables! Tell me: Have you ever used nutritional yeast? 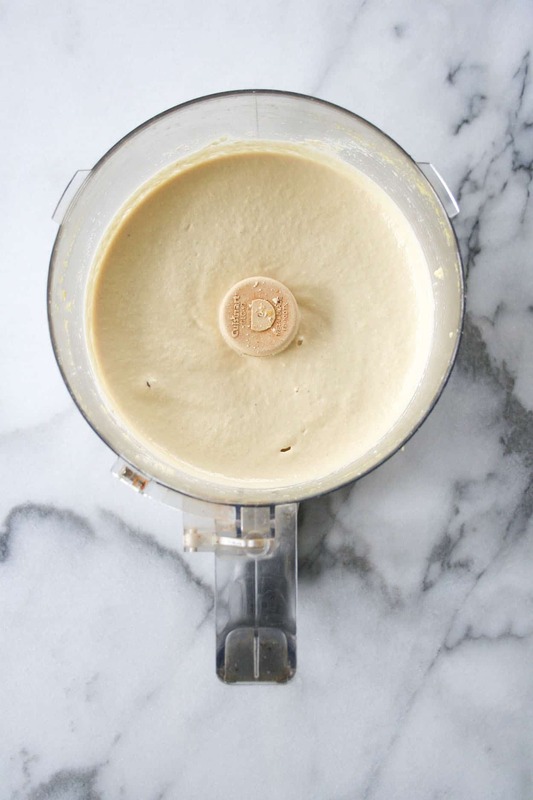 If you make this Cheesy Vegan Cashew Cream Sauce or any of my other recipes, post a picture on social media and use the hashtag #imhungrybynature for a chance to be featured! 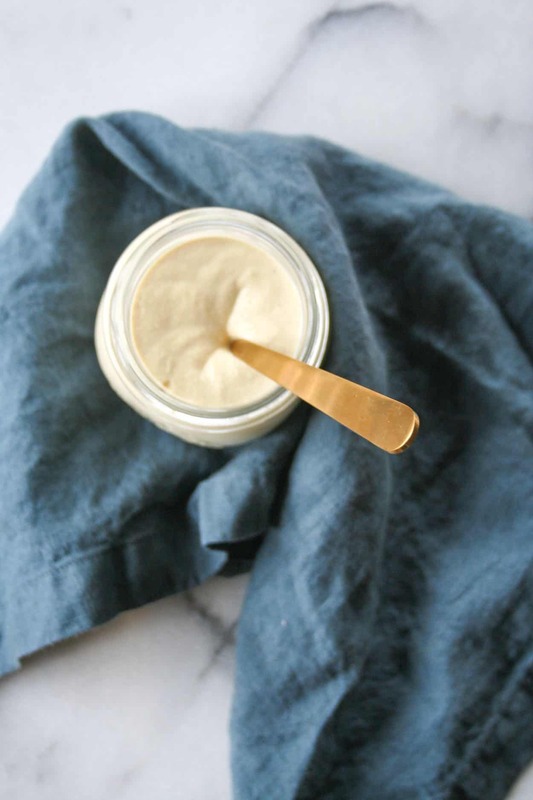 A vegan, cheese flavored cream sauce made from cashews and nutritional yeast. 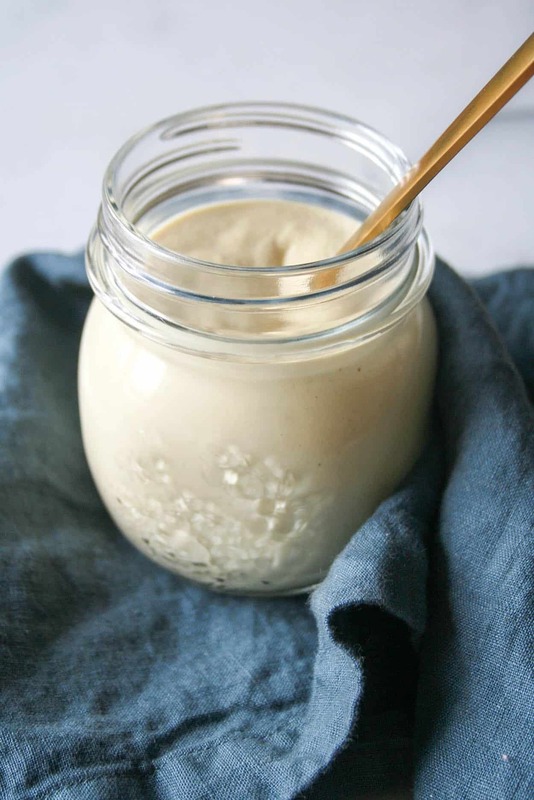 This simple, healthy, and delicious recipe can be made in 5 minutes! In a medium bowl, add cashews, cover with water and soak for 3 hours until soft. Drain and rinse. 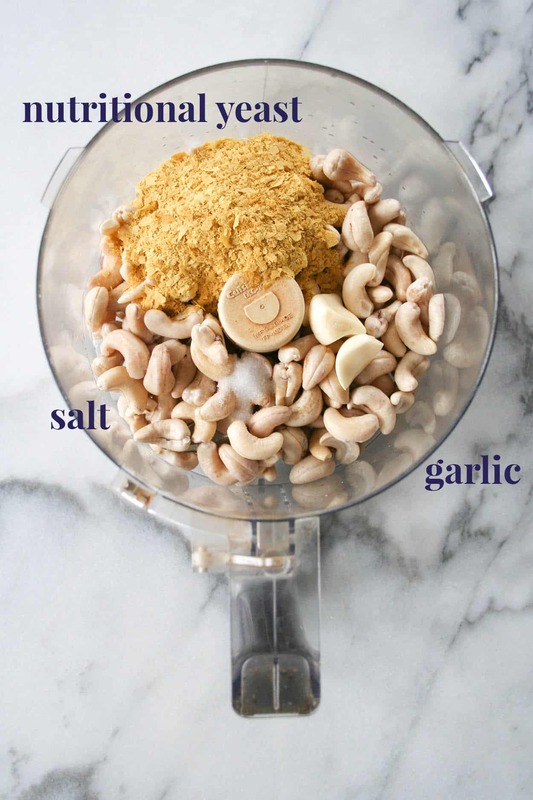 To the bowl of your food processor, add cashews, water, nutritional yeast, garlic, and salt. If you desire a thinner consistency, add more water to thin. Oh, and I also definitely ate some with a spoon. Nutritional yeast totally baffles me too! As someone who is lactose intolerant, I usually try to avoid super dairy-rich foods, but this looks like an awesome alternative! I can’t wait to try it. Yes! You will have to try it… the texture totally weirded me out when I first got it, but after I tasted it, I was hooked! NEED to get me some nutritional yeast!!! I wanna put this “cheese” sauce on EVERYTHING! Wow… It does look so cheesy and good. I never knew that nutritional yeast could be that amazing! Neither did I – you have to try it!! Look how INSANELY creamy that is!!!!!!! Totally scheduling this to pin – I must try your version asap! Thanks Chrissa – I hope you love it! Hey Ellie, this recipe rocks!!! How long will it keep in the fridge? I’m totally gonna use it for zoodle alfredo. Hi Jen! Thank you so so much – I LOVE this recipe and find myself eating it straight off the spoon 😉 It will last a long time in the fridge – a few weeks but I highly doubt it will take you that long to eat it all! Let me know how it is on zoodles! I love this sauce so much!!!!! And a quick tip for you busy folks out there, if you don’t have three hours to waste soaking the cashews, soak them in boiling hot water instead and cover with plastic wrap. 20 minutes later! You are good to go!!! Thanks Ellie! I love your posts! Keep up the awesome work!!! SUCH a great tip – thank you Julie! And I’m so happy you are enjoying the recipes!! For how long we can keep it at refrigerator?? Hi Anfal! This should keep in the fridge for a week to 10 days! I’ve made it 2x and I used roasted garlic the second time. Both batches were delicious. Ohhh adding roasted garlic would be SO GOOD. Oh my gosh, that is one of my favorite flavors! I am glad you are enjoying it Heather!! I made this a while back and my entire family loved it! I am currently soaking cashews to make later today but I was wondering if using unsweetened almond milk would suffice for water. Hi Abby! I am so happy to hear you love it – and your family too 🙂 You can definitely sub in almond milk for the water. And it I bet it will make it even creamier!